Who Else Dread's The Thought Of Trying To Painfully Write Their Own Direct Response Sales Letter? Now You Can Build Your Website And Write Your Sales Letter The Easy Way! I hate writing sales letters and building websites too! It built the very website that you are looking at right now! If you are at all like me you absolutely dread the thought of writing a sales letter, or building a website to sell your product on the Internet. The problem is though without a website and a killer sales letter to go with it you are dead in the water, and I mean that literally! This incredible software not only guides you step by step as you carefully craft your sales letter. It practically writes it for you! Not only does it totally format your sales letter for you just as the sales letter here is formatted it also builds your sales page website for you! Who would have ever thought getting your product online would be this easy! I used to stay up until the wee hours of the morning banging away on my keyboard trying to write my own sales letters. UGHHH I was frustrated and I had had enough! That's when I had my friend Jeff build me this neat little software called "Sales Letter Creator" the very same software you are reading about right now... and the very same software that built the webpage you are looking at right now! Step By Step Process - "Sales Letter Creator" walks you through a simple step by step process, and all you do is fill in the blanks! Its Easy To Use! 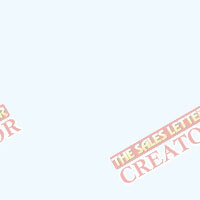 - "Sales Letter Creator" is so easy to use my 8 year old daughter has successfully turned out 4 sales letter with it! She used it to build a sales letter's to sell some of her old toys on eBay! WOW, not thats how I like to create a sales letter and website... just fill in a few blanks and walllla out pops the finished website. Superb! Just Fill In The Blanks! - All you have to do is go through each step and add a bit of text to the empty boxes! Sure it will take a run or two to get it down, but you will be a sales letter writing pro in no time flat, I promise you! Create Your Own Templates! - I say starting from scratch every time is for the birds! Just hit the save button to save your template, then on your next sales letter load it up again into the software and only change the product details! Most of the rest of it can stay the same! It's FAST - "Sales Letter Creator" Is so fast in fact, that it only took me about 20 minutes to create the sales letter you are reading right now! Sure there was still a little work to do. I did have to fill in the blanks but that sure as heck beats the hell out of banging away at my keyboard for hours on end, trying to figure out the HTML to format my page. HTMWHAT, that's what I say, let "Sales Letter Creator" worry about that for you! Thank you so much! I have been desperate to find a tool like "Sales Letter Creator" I can't write or deal with HTML at all and you have made it so easy! Then "Sales Letter Creator" is just what you need! Now you can literally just fill in a few blanks and out pops your completed sales letter! Just upload and you are in business! If you know nothing about web design or HTML that's ok! This software handles all that technical stuff for you! When you order today you will be downloading the "Sales Letter Creator" software immediately! You will be cranking our your own direct response websites, sales letter and all with in the next 15 minutes! Everything you need to get started right away is included in one simple download. Listen, if you don't agree that this it the most useful, money-making software that you've ever used, simply email me and I'll issue you a 100% refund on the spot. No hard feelings and no questions asked. In fact, I'll extend this guarantee for an entire 10 days after you get everything! That's right, 10 days to use and profit from this incredible system, if you do not feel you "Sales Letter Creator" has earned you at least 10 times what I am asking you to pay for it today, then I insist you ask for (and receive) an immediate refund. I am that sure- that when you see how powerful a money maker this software is, you will not even think of wanting a refund! Don't waste another day of wondering how much you can really make if you could just get your idea online! Order Now! Think about this, for a measly $12.00 today you can be on your way to having your very own direct sales website online and making money for you in the next 24 hours! This is a small sum to pay, to start finally taking steps towards getting your website online and starting to live the work at home lifestyle! Look at it this way -- $12.00 is really a painless drop in the bucket to be able to get your hands on Sales Letter Creator and start using it right away to improve your lifestyle! Click here to order right now for only $12.00 (even if it’s 3:00 am in the morning). Yes William Buck, I Just Have To Have This Incredible Package! Count Me In Right Now! Click The Button Below To Order! You have taken a chore I used to dread and made it so easy! I wrote my own sales letter in only 24 minutes and that includes having it places into a full website for me! All I can say is "McDreamy"
Super Job! Fill in a few blanks and out pops my totally formatted website and sales letter! If only everything on the web were this easy! Take Action, And Get Started Making A Great Living Online Right Now! Not Tomorrow, Start Today! You are minutes away from being able to get your website online, in an easy and automated way. Our software will practically write your sales letter for you. All you need to do is fill in the blanks, and I promise you if my 8 year daughter can do it... you can too! 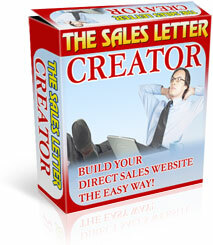 Don't you owe it to yourself to try Sales Letter Creator today? P.S. You will be so glad you can finally stop trying to get your website online the hard way. Don't spend weeks trying to "figure it out" let Sales Letter Creator do it all for you!